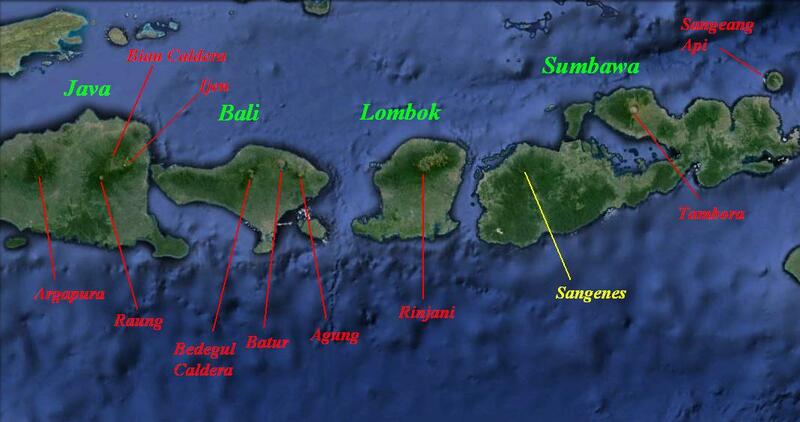 The Sunda Arc from Eastern Java through the Sunda Strait and the Lesser Sund Islands where the Australian plate subducts under the Sunda Plate at a rate given as 6-7 cm per year, relatively high. 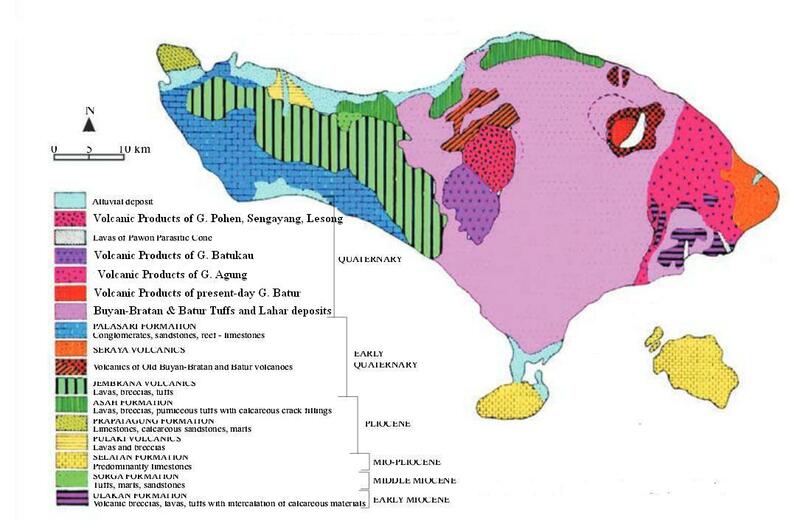 Note that for Sumatra and Western Java, the subducting plate is the Indian plate. 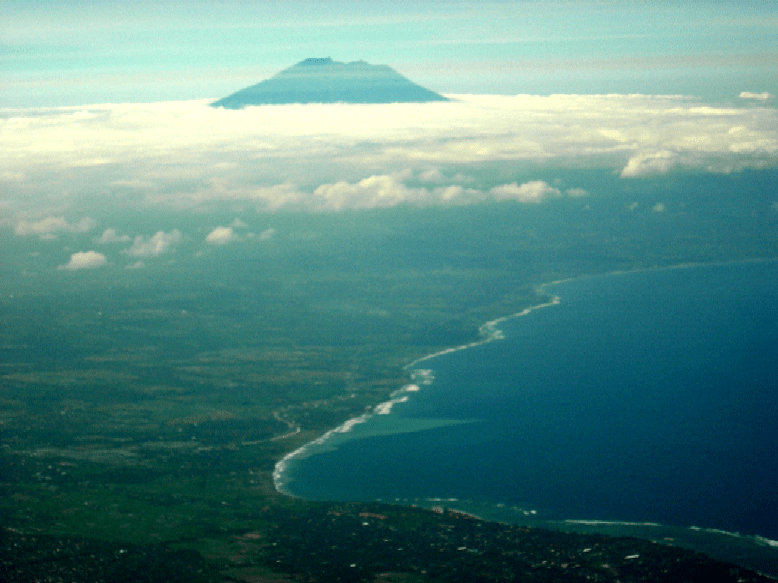 The names of the Islands is green, active volcanic complexes, calderas and the larger stratovolcanoes are denoted in red. Sangenes (yellow) is thought to be extinct. 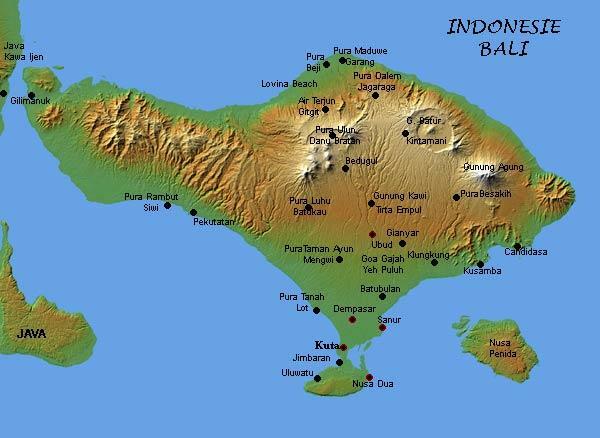 The main tourist locations are concentrated to the South; Sanur on the east coast which once was the only tourist location, Kuta with its beach and close to the Ngurah Rai International Airport, Ubud in the centre of the island and the newer development Nusa Dua and Pecatu. 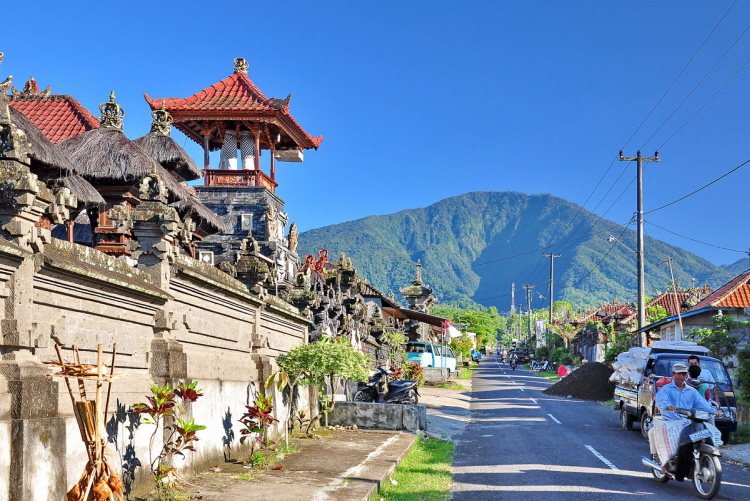 Kuta, the main tourist location, lies 55 km from the centre of the Buyan-Bratan volcanic complex, 61 km from the centre of the Batur Caldera and 60 km from the peak of the 3,031 m high Gunung Agung, The town of Ubud is basically at half that distance while Dempasar, the capital with over 800,000 inhabitants, is within 50 km of all three. 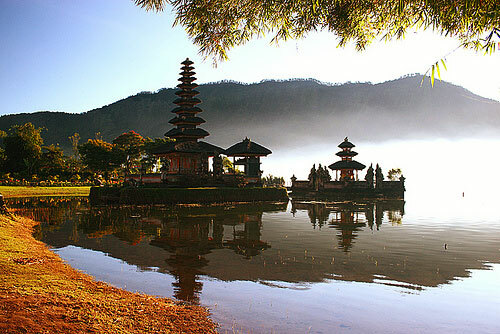 The Buyan-Bratan volcanic complex is also known as the Bedegul caldera, Bratan caldera, Catur or Tjatur caldera. 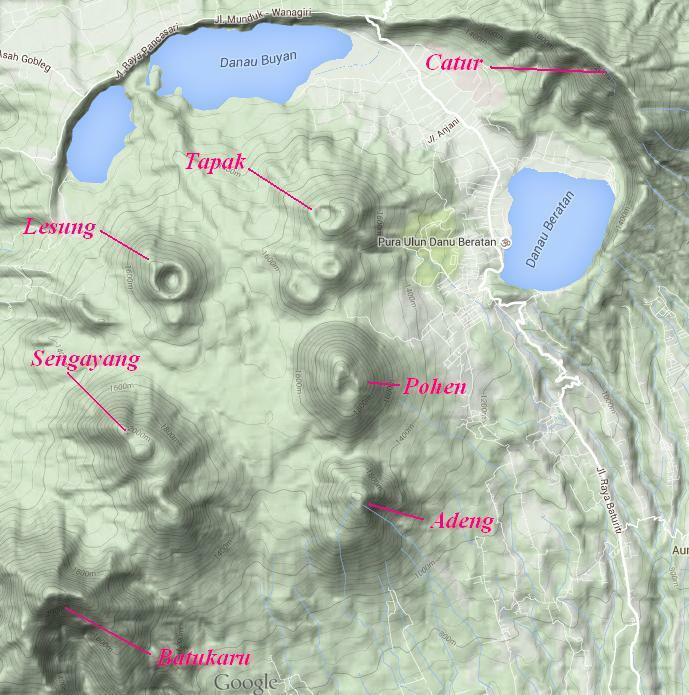 The southern caldera wall has disappeared beneath a superimposed field of young, heavily vegetated stratovolcanoes including Gunung Batukaru (2,276 m), Adeng (1,826 m), Pohen (2,063 m), Sengayang (2,087 m), Lesung (1,865 m), Tapak (1909 m). 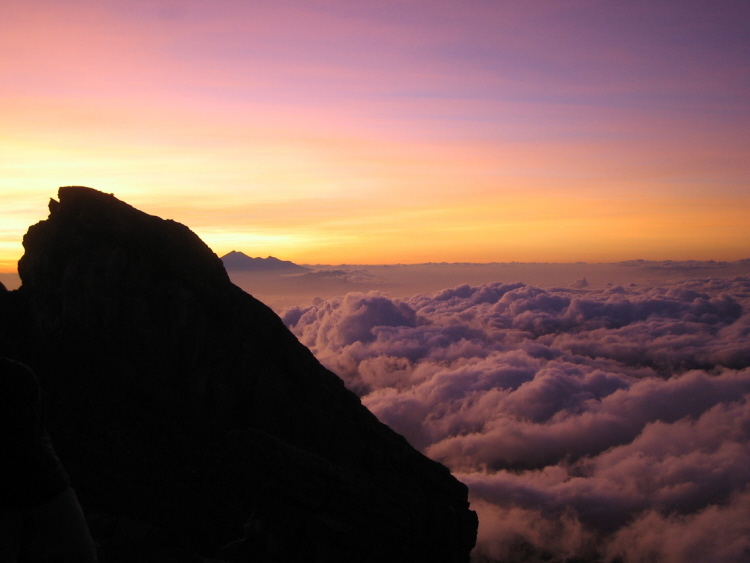 Although the ancestral volcano is known as Mt Catur, the location of today’s Catur (2,096m) on the NE calera rim argues that it may not be a volcano even if it is sometimes referred to as being one. 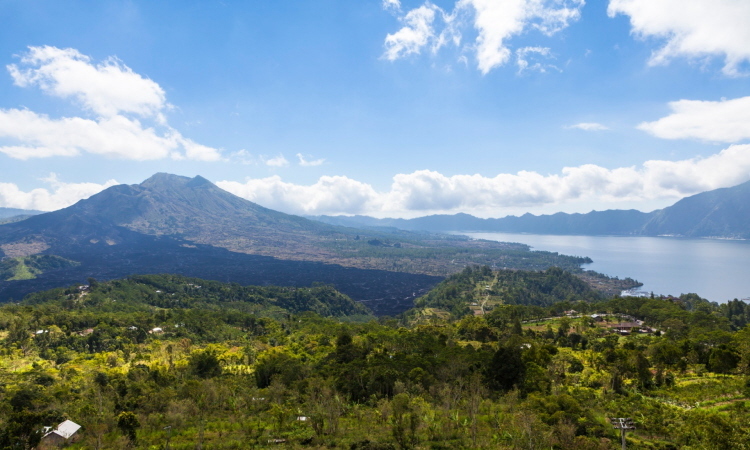 Ancestral Batur was an approximately 4,000-meter high stratovolcano, nearly a kilometre higher than present-day Agung (3,148 m), which had an enormous eruption in prehistoric times to form the outer, 10×13.8 km caldera around 29,300 BP which today contains a caldera lake, Danau Batur. 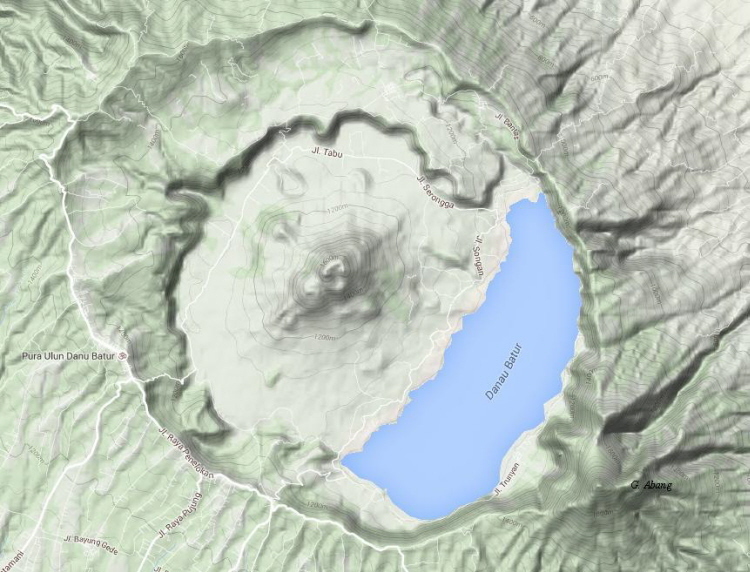 The inner 7½ km caldera was formed at about 20,150 BP. “Ice magma” term makes me think in fresh ways – thanks Albert. Growing up on the north shore of Lake Superior I saw powerful ice each spring that was carving and re-shaping the shorelines and beaches, jumbled up in lifted sheets and blocks in unexpected ways and curious angles, often unstable. That pointy mountain sitting in the dip looks a bit like that to me. What’s number 5 on the list in the NDVP? We are just waiting for Carl to post! Sorry about the delay with No5. It was supposed to have been ready and up on Friday, but it seems not. Our apologies. Yes, I know it obstructs the drivers view, and destroys the mass balance… but think of the obscene boost in horsepower… You may ask “why?” Just look at the front plate… it appears to be Texas. 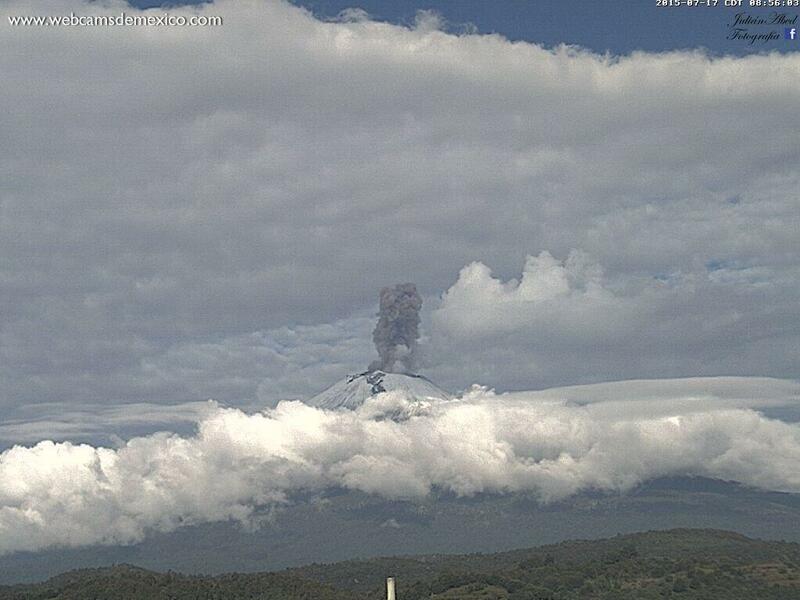 can this outrun a pyroclastic? 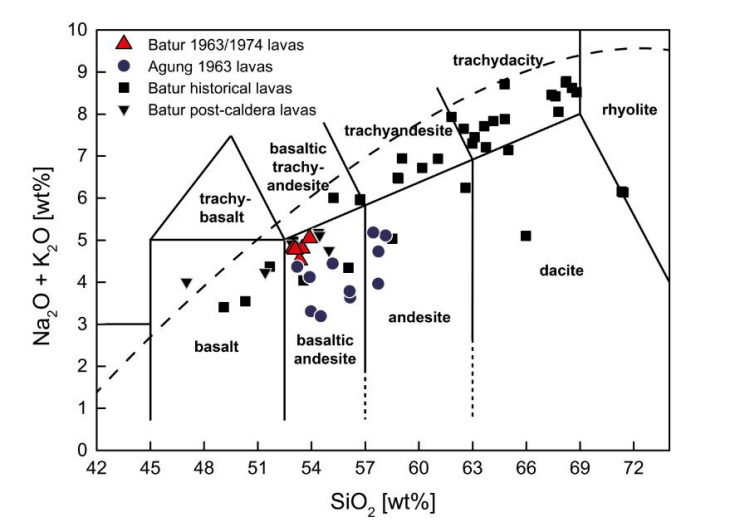 In case the Socorro magma chamber erupts and reaches for Texas? 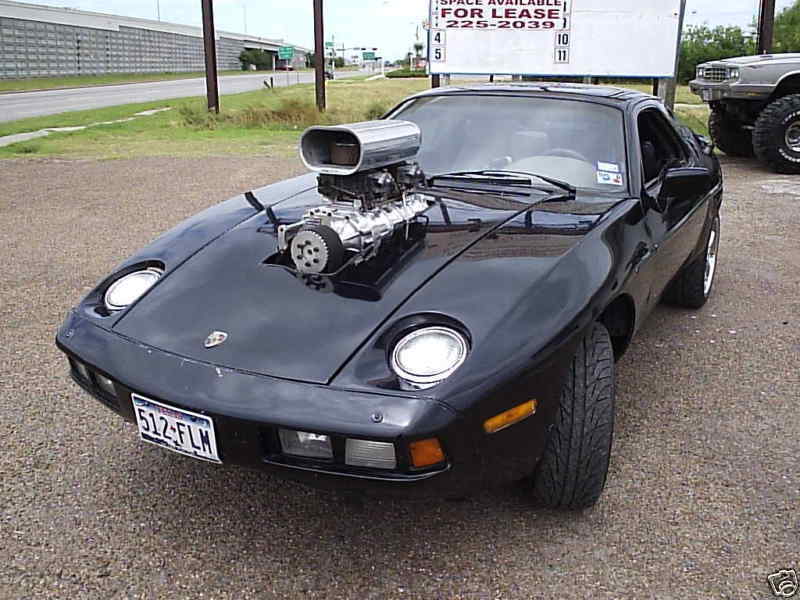 Is that a Porsche 924? 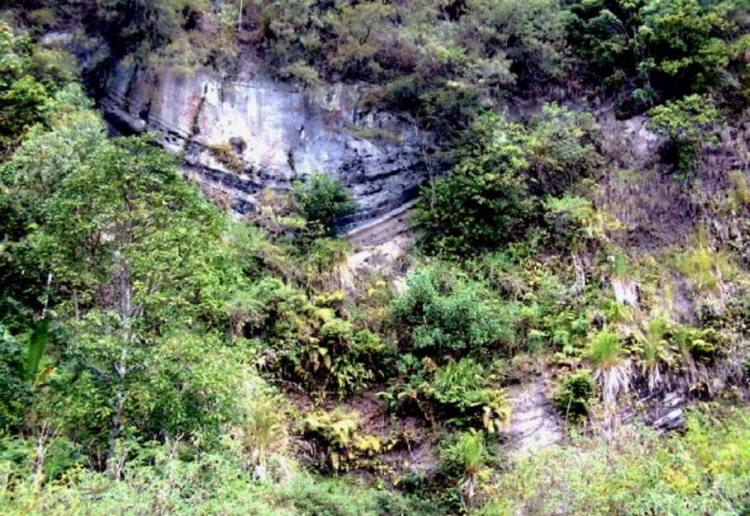 New post on the Toba Supereruption by Albert is up!